Hi i can get the form embedded but I just want a clickable link on my page to show up not the entire form. Is there a way to do that? Although not familiar with RV Site Builder, some googling brought me to this video tutorial that explains in detail how to place all sorts of links on your page. 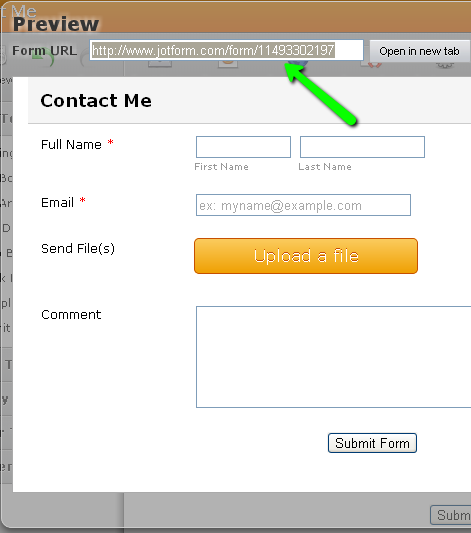 To find out the URL to use for the link, load the form in question into the form builder/editor and click "Preview". Copy the URL and paste it into the section at the bottom (labelled "URL:") as directed in the video. The field at the top labelled "Link text:" is what the user will see on the page. For instance "Contact Me". The text box labelled "Screen tip:" is what the user will see if she hovers her mouse over the link. For example, hover your mouse over this link to see a tooltip: Contact Me. Hi I tried this several times with no luck. I was hoping this was going to be easy but not so.